Energy companies have started to report first-quarter results. Oil-field services giant Schlumberger (NYSE: SLB), one of the first to release earnings, posted a 19 percent decline in revenue and announced plans to lay off 11,000 workers and radically restructure contracts with producers to preserve sales. The dramatic drop in the prices of crude oil, natural gas and natural gas liquids (NGL) catalyzed the industry’s sharp reduction in drilling activity. With much less cash coming in, North American producers have scaled back development activity aggressively and focused on their core acreage. First-quarter earnings announcements could include additional cutbacks to development and production. Shares of most oil and gas producers have tumbled since last summer. Meanwhile, Linn Energy LLC (NSDQ: LINE) and other high yielders have taken the hardest hits after the severe downdraft in commodity prices forced them to cut their payouts. And the longer crude oil remains less than $70 per barrel and natural gas fetches less than $3 per million British thermal units, the more pain high-yielding upstream names will suffer—and the greater the likelihood of additional dividend and distribution cuts. The sharp reduction in North American drilling activity has also forced the market to reevaluate the growth prospects of many master limited partnerships (MLP) and other midstream operators that own pipelines, processing plants, storage facilities and fractionation capacity. Most of these companies tout their long-term, fee-based contracts. But not all these agreements are created equal. Take-or-pay contracts guarantee the a fee regardless of whether the customer uses its allotted capacity; other agreements include volume-based fees, exposing the cash flow generated by these assets to any diminution in throughput. And even long-term contracts sunset at some point, exposing midstream operators to re-contracting risk. Boardwalk Pipeline Partners LP (NYSE: BWP) slashed its distribution by 81 percent last year, after failing to renew expiring contracts at similarly favorable terms. Counterparty risk has also increased significantly with the drop in oil and gas prices; cash-strapped producers may pressure their midstream partners to lower tolling fees or could default on minimum volume commitments and capacity-reservation payments. Crestwood Midstream Partners LP (NYSE: CMLP), for example, must contend with the bankruptcy of Quicksilver Resources (OTC: KWKAQ), one of the producers served by the MLP’s gathering and processing assets in the Barnett Shale, a mature gas-producing play in the Fort Worth area. This news prompted the MLP to reiterate that Quicksilver Resources had paid all its invoices prior to declaring bankruptcy and indicate that the firm will continue to provide midstream services to the ailing producer, for which it expects receive timely payments. Time will tell. Investors will get an update on Crestwood Midstream Partners’ trials and tribulations when the MLP reports results in early May. We’ll also hear what management has to say at the National Association of Publicly Traded Partnerships’ annual MLP investor conference. If Crestwood Midstream Partners doesn’t get paid in a timely fashion, the MLP’s distribution could be under more pressure. Even worse, this default would set a frightening precedent in the midstream segment, raising questions about the sanctity of all those long-term, fee-based contracts. Of course, many midstream names will weather the storm. Kinder Morgan (NYSE: KMI), which last year absorbed El Paso Pipeline Partners and Kinder Morgan Energy Partners, posted solid first-quarter results, with growth in its terminals and refined-products segments offsetting weakness in carbon dioxide and Canada. Not only did Kinder Morgan’s solid showing and 6.7 percent dividend increase underscore the importance of scale and diversification in these uncertain times, but management also highlighted growth opportunities transporting natural gas to Mexico and utilities in the Northeast. The latter expansion projects would deliver inexpensive natural gas from the Marcellus Shale to regulated utilities in the Northeast. Given the solid balance sheets and regulated returns generated by these utilities, these contracts entail limited counterparty risk relative to those signed with cash-strapped oil and gas producers. First-quarter results from our other favorites will go a long way toward distinguishing the winners from the losers in the MLP patch. And we’ll take full advantage of our opportunity to grill management teams at the NAPTP’s upcoming MLP investor conference. Energy & Income Advisor subscribers will have access to our key takeaways and best ideas from this event, where more than 90 MLPs will present. We’re already drawing up our schedules and assembling our lists of questions for the post-presentation breakout sessions. As a reminder, Energy & Income Advisor covers every energy-related MLP—a universe of more than 120 names—as well as more than 70 Canadian energy stocks and a host of prominent US companies from every link in the energy value chain. From this extensive coverage universe, we distill our best investment ideas for conservative and aggressive investors into three model Portfolios. 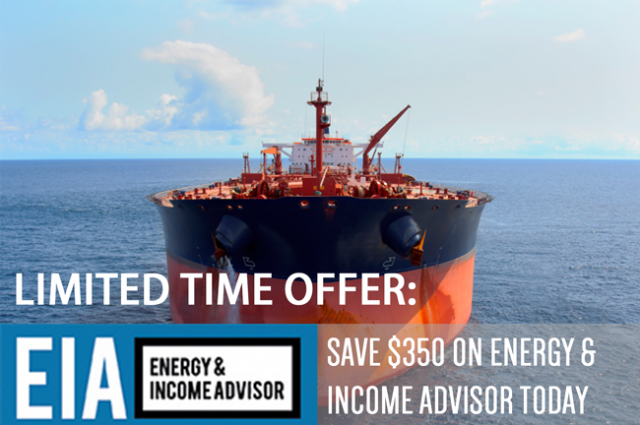 Learn more about how you can save $350 on an annual subscription to Energy & Income Advisor. Kinder Morgan’s shares have returned almost 26 percent since June 30, 2014, an impressive performance over a period when the Alerian MLP Index gave up 11.2 percent of its value. 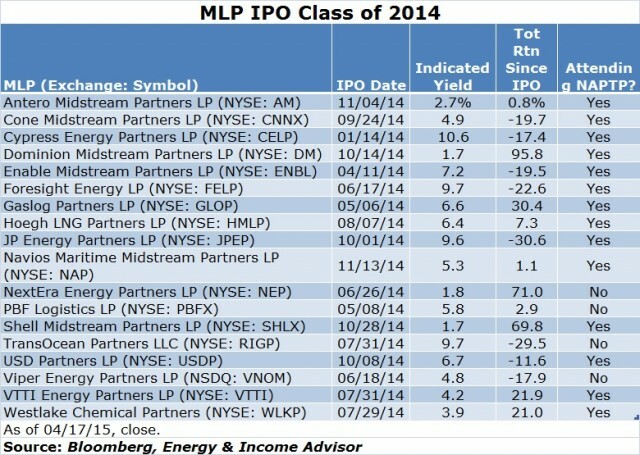 One place to look for bargains in the MLP space is among the class of recent initial public offerings (IPO). The biggest winners from the MLP class of 2014 share one commonality: All offer exposure to high-visibility growth stories, fueled by drop-down transactions from their sponsors. Dominion Resources (NYSE: D), for example, plans to drop down much of its extensive midstream infrastructure to Dominion Midstream Partners LP (NYSE: DM) over time, driving the MLP’s distribution growth. NextEra Energy’s (NYSE: NEE) spin-off of NextEra Energy Partners LP (NYSE: NEP) offers exposure to a similar story involving generation capacity that operates under long-term contracts. Meanwhile, Royal Dutch Shell (LSE: RDSA, NYSE: RDS/A) likely will accelerate its plans to drop down midstream assets to Shell Midstream Partners LP (NYSE: SHLX) after announcing the acquisition of BG Group (LSE: BG/, OTC: BRGYY). Given the uncertainty surrounding energy prices and the demand outlook for additional midstream capacity, investors have gravitated toward names that can deliver above-average distribution growth through drop-down transactions. The assets involves in these deals are a known quantity and aren’t subject to a competitive bidding process. However, many of last year’s IPOs have underperformed. TransOcean Partners LLC’s (NYSE: RIGP) unit price has slumped amid concerns about the oversupplied offshore drilling market and producers canceling existing contracts. Foresight Energy LP’s (NYSE: FELP) stock caught a bit of a bid earlier this year after privately held Murray Energy announced the acquisition of an interest in the MLP’s general partner. But depressed natural-gas prices and the closure of more coal-fired power plants have weighed heavily on shares of coal producers this year. Contracts suggest that the MLP’s almost 10 percent yield should be safe, while Murray Energy’s sponsorship creates an opportunity to grow through drop-down transactions. Nevertheless, coal producers remain out of favor for good reason; negative sentiment toward this group will keep a lid on any potential upside. All the MLPs in the class of 2014 have the same question marks surrounding their track record; none of these names were around when energy prices collapsed in late 2008 and early 2009. 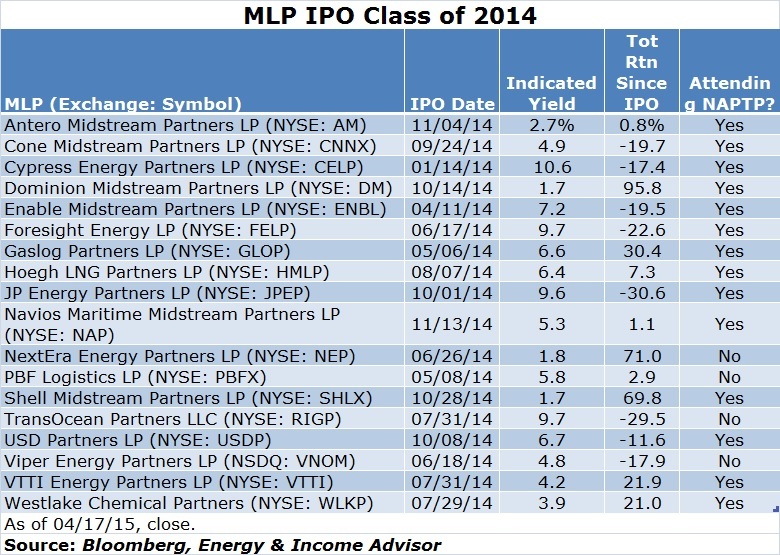 Most of these MLPs launched during the salad days when producers focused on growing their output at any cost. But there are some enticing yields on this list; we plan to talk to these management teams at length next month to see if we can unearth any diamonds in the rough. How will we separate the wheat from the chaff? We’ll focus on first-quarter results, the credibility of these MLPs’ most recent guidance and our own discussions with executives at the NAPTP’s annual investor conference in late May. Energy & Income Advisor subscribers can look forward to an in-depth roundup of key takeaways from the NAPTP’s annual MLP investor conference as well as our top picks and pans. Our top picks from the past two editions of this conference have outperformed the Alerian MLP Index by a roughly 7-to-1 margin over equivalent holding periods. The stocks that we told investors to sell or avoid have lost an average of almost 30 percent of their value. Two of these pans also slashed their distributions. Expect the difference between the winners and losers to be even more pronounced this year. The Chinese character for “crisis” is a combination of those for “opportunity” and “danger.” As Schlumberger’s CEO noted this week, the North American energy business is definitely in the midst of a transformative crisis. Although risks are ubiquitous, so are opportunities to lock down high, growing yields from MLPs that will survive and thrive. Finding them while dodging the danger is our task in the coming weeks. Here’s to good yield hunting!